In the fall when the sweet red peppers sales hit the market, it’s hard to come home with less than a dozen…or two. The dense flesh, bright red color and rich flavor makes these peppers almost irresistible. If you are like me, there comes that moment when the 20 peppers sit in a heap on the kitchen counter and you wonder what you will cook first, or second, or third. Here is a soup recipe that you could quadruple and use up the whole pile of peppers if you so wish. Use the soup to feed a crowd, or freeze the soup base in smaller quantities for days when those gorgeous red peppers will be a distant memory. I found the inspiration recipe on Food 52, submitted by Oui Chef. This man knows his food! If you follow his blog, you know he is highly trained in the food area and also quite funny. In the directions below you will find Oui Chef’s soup with simplified preparation for saving some time in the kitchen. The changes I do not believe compromised the flavors. Surely not! We were swooning over our bowls just from the fragrance. While Oui Chef goes with cilantro oil and feta cheese for a North African sort of flavor, the tray of roasting vegetables smelled very Italian to me. I changed the seasonings. Either way works. It just depends on what strikes your fancy when you get to the seasoning part. Preheat the oven to 375. You can go higher for a quicker roast, but I prefer the longer, slower roast. I prefer the flavor and there is less of a chance of the oil reaching its smoke point. Using your hands, oil the peppers, tomatoes, onion, and garlic. Use a high-heat oil of your choice. 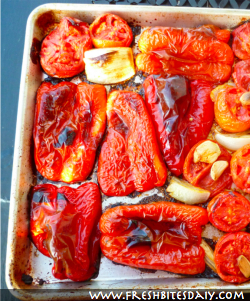 Arrange the peppers and onion cut-side down on a large roasting pan. Arrange the tomato halves cut-side up. This way the juices are saved and condensed. Tuck the garlic into the tomato to protect it from burning. Roast the vegetables for about an hour. They should all be soft and a bit blistery. The pepper skins should just be beginning to char. Remove the roasting pan from the oven and allow the vegetables to cool enough for handling. Remove the skins from all the vegetables before dropping them into a food processor. If you have a large processor, one run will do it, otherwise, puree in multiple batches until all the vegetables are pureed into a smooth red pudding. Heat the chicken broth in a large soup pot. If you keep a broth pot going all the time, the broth is probably already warm. Add the pureed vegetables to the broth along with the smoked paprika and stir. You may want a bit more stock if the soup is too thick. Gently warm the soup over a low flame. While the soup is warming, melt the butter in a medium skillet. Saute the shallot for a minute then add the corn and thyme. You want to heat the corn and blend the flavors but not over-cook the corn. Part of the charm of this soup is the sweet crunchiness of the corn. Add salt and pepper to taste. Check your soup for salt and pepper. Make any necessary adjustments. Place a small pile of the corn mixture in the middle of your warmed soup bowls. Ladle on the soup and garnish with a sprinkle of cheese and fresh basil. 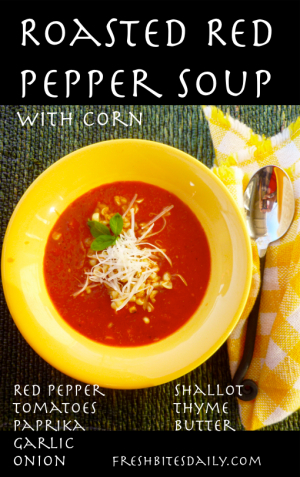 1 Comment on "Roasted Red Pepper Soup with Corn"
This sounds scrumptious! Peppers are long gone in my area of the country but I’ll save the recipe for next summer. 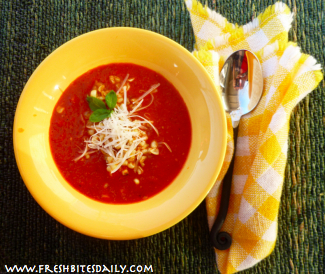 I have only made roasted red pepper soup once. That was about 15 years ago and it was so much work that I never repeated it. That time I roasted each pepper by hand over the stove burner. It took forever and I burned my fingers. At that time I wasn’t in the habit of roasting vegetables in the oven so I never thought of that.